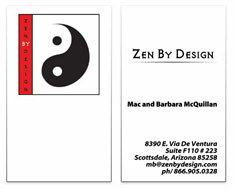 Your business cards will speak volumes about you and the pride you take in your business. It's not just designing, it's designing for Print. The rules are different and they're exacting. Production costs are higher than website development, so it's important to have a seasoned professional in your corner. When it comes to great print advertising and design, there's no better value. Compare us to any quality "full-service agency" and you'll discover how much you save without sacrificing quality. Make sure your business card looks professional, that there are no spelling errors, it's up to date and properly printed on good quality paper. However good your inkjet printer, home-made cards look just like that and seldom fit the bill. If your business card screams "cheap", people will expect your services to be the same. Plumb for decent business cards and you'll attract better clients who are willing to pay a fair price for your services. 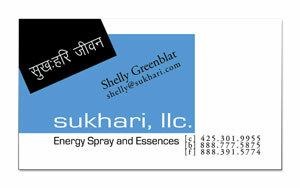 Make sure your name is clearly visible on your business cards. Apart from making it easy for people to read, you can use your business card to double as a name tag at networking functions - a great way to get lots of mileage from your investment. 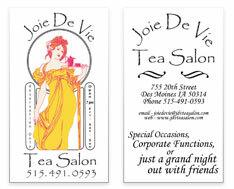 Have your business name and logo design on the business card The more unique and effective, the better. Invest in having your logo design professionally designed. It will cost comparatively about 300$ and you can use it over and over again on everything from brochures and your web site to presentations and adverts. Ensure all your details are on the business cards. Where possible, include your name, title if relevant, phone, fax, email, web site and postal address. It's not necessary to include your home address on your business cards unless you expect clients to come to your premises. Adding the words "by appointment only" or "by appointment please" is appropriate if you consult from home but don't want people dropping in unexpectedly. 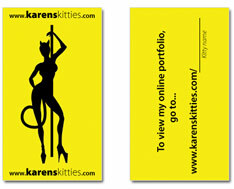 Be smart - use your business cards as a mini-brochure. how I can help you double your bottom line in six months), list product lines or services you offer, give some relevant tips or leave space for customized information (e.g. write down the color of the paint they have chosen) or an appointment time. The more valuable you make this to them, the longer they will keep your card and the more they will refer back to it.